Welcome back for the second day of Mayfairstivus, the nine day celebration of Mayfair Games’ DC Heroes Role-Playing Game! Today we’ll be looking at all three editions of this RPG. 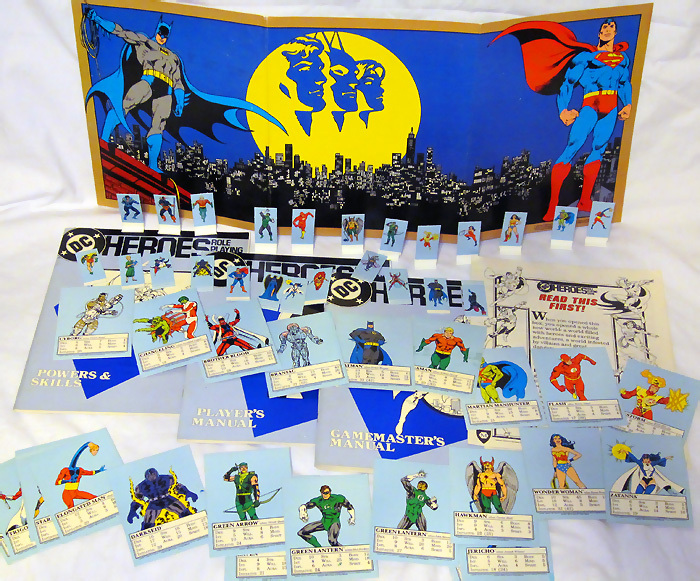 The first edition of the DC Heroes Role-Playing Game was released in the summer of 1985. Below you’ll find the gorgeous George Perez cover to the first edition box set. The image echoes both Crisis on Infinite Earths and the Super Powers line. And if you had any doubt how popular the New Teen Titans were back then, check out the call-out to them on the cover. 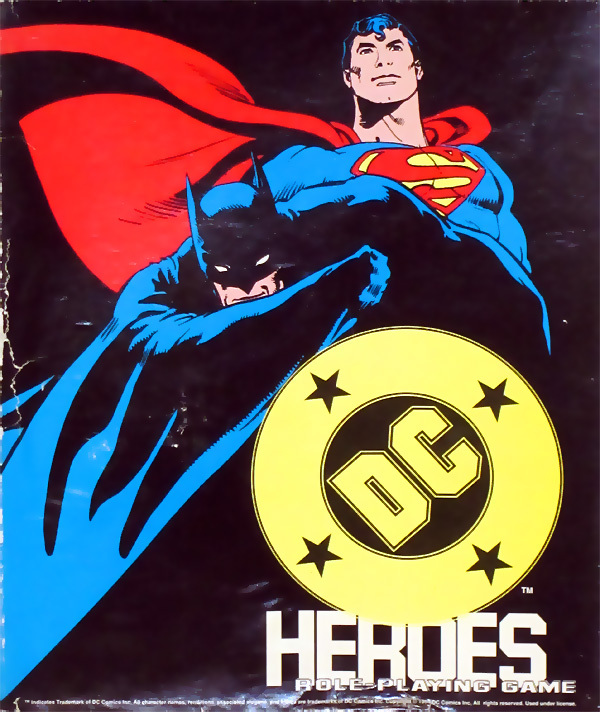 The second edition of the DC Heroes Role-Playing Game was released in either late 1989 or early 1990. While all the copyright information states 1989, I found some advertisements suggesting it was scheduled to be released in early 1990. The second edition was a real improvement over the first with updated and expanded rules. While I think the first edition was much “prettier”, I think this version was the most useful. This is also the edition I played the longest, so I’m probably biased. Below you’ll find the cover to the second edition box set. While this cover is not as epic as George Perez’s first edition cover, there is a certain elegance and iconic appeal. 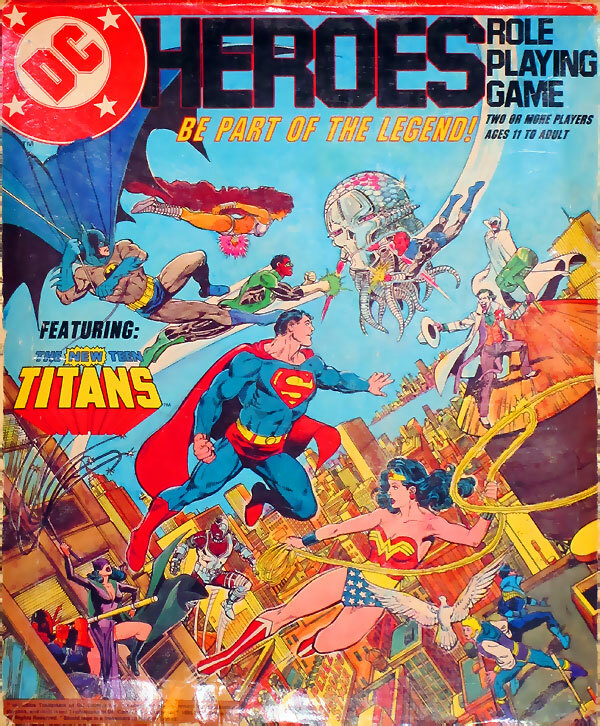 The Background/Roster Book – including game statistics for over 250 characters and featuring essays by Robert Greenberger, Jack Kirby, Robert Kanigher, Neil Gaiman, Dan Jurgens, and Roger Stern. Full-length Justice League International module – Exposed! 75 illustrated characters cards – The cards in the image above are stored in nine-pocket card pages. These pages were not included in the original set. That’s just how I choose to store them. 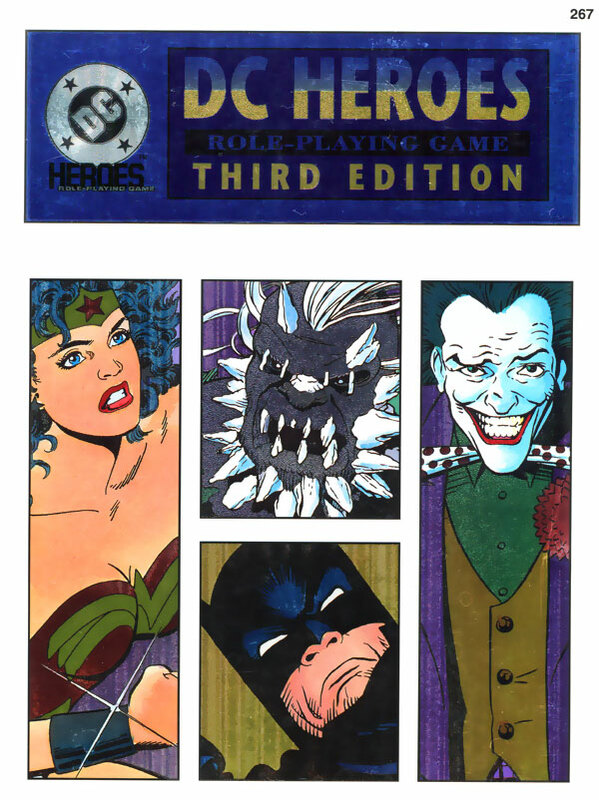 The third edition of the DC Heroes Role-Playing Game was released in 1993. Compared to previous editions, I’m not terribly familiar with this one. By 1993 I’d moved on from superhero role-playing to Star Wars role-playing using the West End Games system (another of my all-time favorite RPGs). For the third edition Mayfair opted to release a single softcover book, rather than another box set. I’m not 100% sure, but I believe this may have been the last product Mayfair produced in the DC Heroes line. One of the selling points of this book was the inclusion of Doomsday and the four “Supermen” from the then-current Reign of the Supermen storyline. Due to the highly-reflective foil cover, the scan below didn’t come out very good. The party was pretty much over by 1993 for Mayfair Games and DC Comics joint venture. 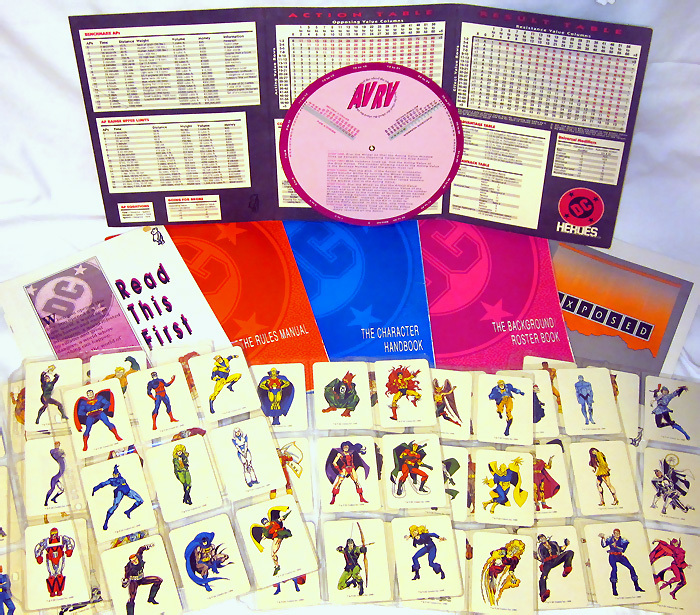 We wouldn’t see another DC Comics role-playing game until 1999 when West End Games got the license. Someday we’ll have to look at the West End Games edition. Come back tomorrow when we look at the Doctor Fate character card from the 1989 edition! Awesome work, Shag! I was trying to figure out how to reproduce my ’89 box, so I’m really glad you saved me the trouble and did it instead. That ’85 box is truly a thing of beauty, as is the narrator screen. Is there any chance I could con you into scanning a few more of those lovely ’85 cards for me? I hadn’t realized the 3rd edition came out after the Who’s Who supplements, but the timing is right. I only ever played this version, which I enjoyed without major complaints over the mechanics. All of these Mayfairstivus links are amazing, Shag. I just read your post over at speed force about the Flash and really liked that too. It’s like finding more and more presents beneath the Mayfairstivus tree! I had the 1st and 2nd editions of the rules but had mostly stopped playing RPGs by the time the 3rd volume came out. Much the same way you were confused about the timing of COIE and the entry spoiling Barry’s death, I am puzzled by the image of Doomsday on the 3rd edition. The death of Superman would have just happened, right? Perhaps I am remembering it wrong. Early in the 90’s I mostly read marvel/x-men.